Reduced IRF8 expression in macrophages leads to increased experimental lung metastasis. (A) 4T1 cells (5 × 104) were injected i.v. 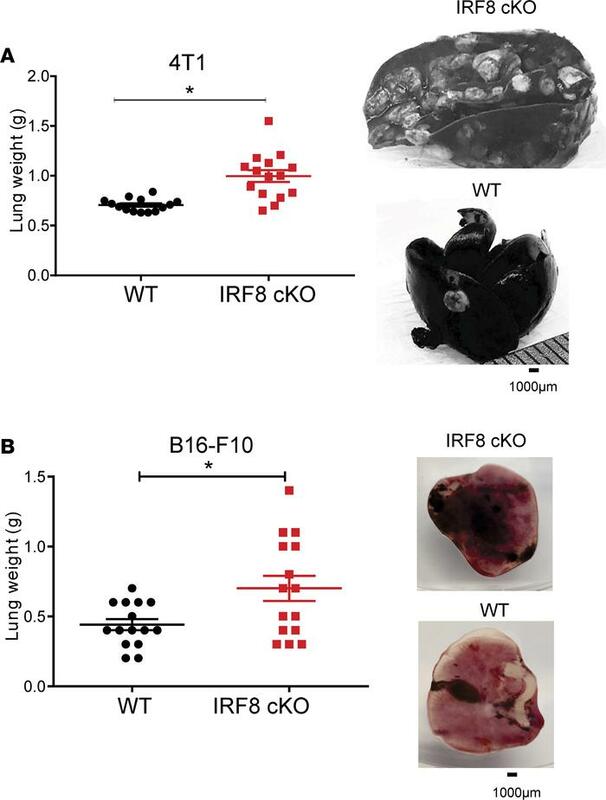 into chimera mice reconstituted with WT (IRF8fl/fl) or IRF8-cKO BM cells, as in Figure 2. (B) B16-F10 melanoma cells (2 × 105) were injected similarly but in syngeneic WT or IRF8-cKO genotypes. Metastatic burden was quantified ~30 days after tumor inoculation by lung weight (Mann-Whitney U test, mean ± SEM of 15 mice per group; *P < 0.05). Right, representative images of whole lung. For the 4T1 model, India ink was used to stain the metastatic nodules, which appeared white against a black tissue background, while in the B16-F10 model, the nodules were readily detectable without stain, which appeared black against a pink tissue background.